Asimov is once again at his best: exploring, inspiring, hypothesizing, and teaching. Whether he’s imagining a world in which silicon molucules would serve as the basis for life, speculating on the limits (in both directions) of the electromagnetic spectrum, or simply fiddling around with algebraic equations, Asimov presents his characteristically brilliant essays on physics, chemistry, mathematics, and astronomy with the wit and wisdom that have made him the most popular writer of science today. 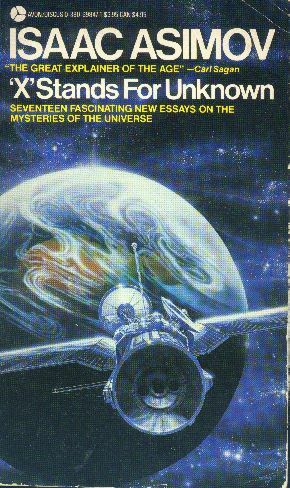 It is hard not to adore Asimov’s collections of F&SF essays, and this one is no exception. It is the final three essays, however, which make it an outstanding entry in the series: first of all we have an essay about mathematics after a long, long gap (hurrah! ), and then we have two harsh, savage, but much needed attacks on scientific creationism and the attempt to disguise as “science” an unnecessarily literalistic reading of Genesis which is an insult to science and religion both. Asimov otherwise and elsewhere attacks creationism, but it’s still worth reading his work here.